The dollarization and one of the most important challenges facing policy makers in developing countries in general and Iraq in particular, which means the use of the U.S. dollar or any foreign currency have the capacity for the replacement of the national currency in transactions and contracts internal financial Auadha other words means payments local parallel to the national currency unit account and a store of value at the same time. And despite the fact that dollarization financial, formed mostly of local loans granted in foreign currency through a long period, and that of up in some Latin American countries to about 70% of the total loans granted locally, but the monetary authority Iraqi has adopted one of the concepts of financial institutions International amended, to express the phenomenon of dollarization in Iraq. The prevailing concept of the International Monetary Fund (IMF) regarding partial dollarization partial Dollarisation is more an expression of the reality of the phenomenon of dollarization and sovereignty in severe yield economy monetizing. If foreign currency bank deposits to money supply in the broad sense about 30% or slightly more, the country is living, for example, the phenomenon of partial dollarization. But if we take into account the installation of the money supply in Iraq, which is dominated by the character of the currency in circulation relative to the money supply and that up to about 50-70% of the total supply, then we must find, that the United States dollar cash is still the other realizes as a currency parallel to the local currency in circulation outside the banking system Parallel Currency in settlement of transactions and cash payments of the Interior, as well as several store good value as we have indicated in advance, so we can say that the phenomenon of dollarization partial is still prevalent and exceed 30% in the settlement movement transactions and payments cash in the national economy Orobma up to a higher level Pktherahiana. Despite the progress, the monetary policy adopted by the Central Bank of Iraq in the framework ستراتيجيته (impeding his stride )efforts to achieve the goal of stability, has shown that the financial system Almdolr taking moving towards gradual decline and dollarization phenomenon partial and rooted are today less than previous despite recent volatility edits in price dinar against the dollar, because freedom of foreign exchange and monetary policy is still working to enhance the external value of the Iraqi dinar, which rates rose dinar exchange in recent years to more than 25%, where it has rational expectations of the audience, all of which serve to keep the Iraqi dinar because of the gradual improvement in value of the Iraqi dinar and the high exchange rate against the U.S. dollar. Monetary policy has also initiated, to establish an effective framework works towards strengthening confidence in Iraqi dinars. It helps confidence in the local currency to create the conditions for strong and deep in the stability of the financial system. 1 - intervention tool to achieve stability in the value of the Iraqi dinar by defending the equilibrium exchange rate, which reflected positively on the general level of prices, especially imported goods final production inputs and strengthens the export base. 2 - as a way to apply the tools of indirect monetary policy in the management of the economy and liquidity control Mnasebha, and express window for cases of the application of open market operations required on an ongoing basis to achieve balance in the money market and strengthen the opportunities for financial stability. 3 It is a key source of financing private sector trade of goods and services needed by the Iraqi market and almost unique window alone for being a key financier of the private sector's foreign trade. Second: all goes monetary policy adopted in all directions towards providing opportunities for stability and success of the national economy. It only policy that is unique also such overall objective in addressing inflation and lower rates of annual increase in the general level of prices and the strengthening of stability in the financial system at the same time, as is monetary policy itself a producer of a public good is unique in its importance is good to maintain the stability of purchasing power of the national currency , especially after linked that policy Bajrat reformist basic synchronization where the goal to strengthen the bonds of the money market and brokerage operations with the necessities Astaqrarsouk foreign exchange and support the stability of the external value of Danaralaraca, as led Twasenhma to achieve signals Sareeten powerful of market signals that Tbnthma monetary policy to achieve its goals mentioned by the two reference interest rate on the Iraqi dinar and the reference exchange rate of the Iraqi dinar over foreign currency. Valthrr financial markets have been experiencing Iraq over the past eight years, embodied actually the domestic financial market through freedom of the banking system and the launch of its ability to determine the interest rates payable and receivable, has, which promised a fundamental pillar of strengthening financial intermediation which is the essence of financial stability, particularly after it was disposal for measures are coercive policies were monetary and regulatory previous adopted through means direct, and resorting to policies indirect dependent market forces to avoid the phenomenon of braking and financial control compliance and of developing ceilings on bank credit or select a credit or impose interest rates administrative outside market forces and balances . Where he led the braking financial past policies during the past two decades to deviation financial market and weaken climate mediation where, as well as adoption of a policy Monetary cheap for the purposes of lending the general budget, which has delayed economic development for decades and plunged the country in a wave of hyperinflation and continuous and dissolved speculative price on goods and services for investment product and low total savings, which plunged the country into a long recession led to the deterioration of the economic and social development, and its origins to the level tattered economies, a phenomenon that still live in some of its negative effects so far. The progress made monetary policy current in the face of runaway inflation of the country and use a reference interest rate monetary policy policy rate as part of its dealings with the banking system, have had the greatest impact progress in the face of inflationary expectations continuing and escalating, which was ridden in Asagraralblad and crushed investment decisions real when the benefit sectors speculation. And this has earned signal nominal interest rate on the Iraqi dinar for the first time with a hint of the nominal exchange rate momentum Astaqraraa strong, reflected in turn the stability of transactions in the national economy and helped keep real interest rates is negative for the first time in the history of the country (and after more than three decades) outweigh the nominal interest rate on inflation, boosting the ability of the financial system to continue and give the money market opportunity stability and permanence in the most exceptional circumstances experienced by our country in recent years that followed 2003. With declining inflation basis of 34% annually five years ago to between 3% to 6% annually with the present and into the era ranked decimal per inflation, the reference interest rate adopted by the central bank have fallen are the other with falling inflation of 20% per annum to 6% Currently, after he made a reference interest rate monetary policy aimed at achieving strong returns on the Iraqi dinar and convert it into an attractive currency and bumper strong in the face of inflationary expectations that have plagued the country over the past eras of time and shook the pillars of stability. Noting this occasion to need Ttmina Profile Per pens, which opposed the measure extraordinary in raising interest rates for a period not long at the time, but we have to say that the root inflationary expectations inherited from the era of economic decline earlier that were produced by phases wars and punish conflicts on the country, necessitated surgical procedure sharply the phenomenon of inflationary, through militancy in raising the reference interest monetary policy temporarily, which came in agreement with the International Monetary Fund dictated the Paris Club agreement in order to complete the write off 80% of the debt of Iraq's foreign and accumulated until August 6, 1990 and bore the consequences of financial barbed and bitter were parked on the economy of our country. Despite market liberalization of financial and subdue monetary policy to work according to market mechanisms, as well as giving the financial system in general and the banking system in particular the freedom to determine interest rates Bnevshma without the direct intervention of the authority of the Iraqi Central Bank (except firing signal interest monetary policy), but the central bank has noted regrettably that the banking sector has remained stick signals high interest on loans granted to the public and rates still exceed inflation rates are widely which is displays financing for development in this era of stable witnessed macroeconomic to risk economic stagnation and disabling physical and human resources to the private sector and the general market National. It is still loans granted by a lot of banks convergence of averages annual about 13%, but may reach the interest levied on loans granted to the public in some of them to between 17% - 20% per annum which is totally unacceptable whatever the pretexts advanced by national banks Under the cover of exaggerating the dangers of the market!! That the exercise of influence or persuasion literary set with national banks and urged them to reduce interest levied on loans and encouraging them to give credit interest Misrhgar arbitrarily ordered to serve economic activity development in the country, a move necessary may resort monetary authority to promote the adoption of additional measures motivational, such as the pursuit of Configure a bank loan synthesis between banks for the purposes of real investment or even work through legal means available, including possible monetary policy of reducing the points spread between bank interest payable and bank interest city (as is still interest rates and unfortunately when some banking entities is less what can be on savings deposits and top what can the credit granted to the public) by making points spread at normal levels that do not exceed 3 points and according to المارسات (Practices are closely following ) traditional banking and natural, instead of its current adult 7-10 points Awakther which is intersects with goals of financial stability which Tacherh Principles and standards of banking supervision contemporary which is based on assigning any orientation leads to provide a climate of stability in the banking market. Conclusion: The importance of promoting the idea of ​​establishing a loan synthesis provided by all banks and cost benefit Twaznip and led acting, for a group of banks, and one of the national banks, in order to finance important projects vital to serve the public directly and consistent idea and generate an atmosphere strong and sound to deepen financial intermediation and activate and means, at a time when the economic policy of the whole country to encourage real investment and strengthen the development opportunities and promising development in the private sector through the incubator stability, and work development program with the strong push, which requires the establishment of a coherent network of investment projects that depend each other in rival inputs and outputs and strengthen models of balanced development other by establishing industrial parks with activity-based interdependent As noted or establish integration projects agro-industrial and other activities cluster or complementary direct impact in strengthening the opportunities the widespread use of the work and investment skills of different human and strengthen technological opportunities and capital within the framework of movement building Iraq signing or shifting to a market economy and contemporary visions within the partnership option between the market and the state transition. Dollarization is an issue, since contracts and all transactions have to use this due to its higher value. Iraq is partially dollarized due to its sovereignty in severe yield which to me means the monetary independence their oil brings. This partial dollarization is over 30% of supply and parallels a "local currency" because it's used so readily. Then, it moves into the monetary policy to establish an effective framework that will strengthen confidence in Iraqi dinars. "It helps confidence in the local currency to create the conditions for strong and deep in the stability of the financial system." Again, stuff we know, but the case is being stated here. I found it interesting that the policy will "target" this issue of partial dollarization.....this tells us the current status is obviously not the intent of the monetary policy, so that is good. 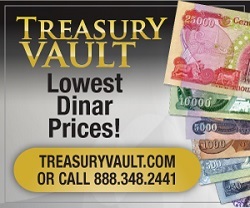 Domestic interest rates, exchange rate movements, moving cash electronically, ......making the dinar attractive. The auctions were next, how it is a tool for achieving stability in the dinar, balancing the money market....all while generating fees which was good on the income statement. It also provides financing for private sector trading. Then, stability in the national economy was discussed...addressing interest rates and a low inflation rate. It then moves on to show us how work still needs to be done in relation to interest rates (for loans) in relation to the inflation rate....more stability and growth needed here as it is a vital underlying thread to economic growth and stability. These are the things I've found. A good report!